As assigned crew First Pilot (6 missions - 145 (30 Apr 1944), 150, 151, 153, 155, 157 (22 May 44). As a Lead Crew Pilot or CoPilot) (20 missions - 176(TG/O), 187(CP), 195(CP), 199(CP), 200(CP), 207(P), 209(CP), 210(CP), 217(CP), 225(CP), 235(CP), 250(CP), 274(P), 277(P), 216(CP), 324(CP), 347(P), 352(CP), 354(CP), 360(CP)(15 April 1945). (TG/O) As Tail Gunner/Observer -- (P) As Pilot -- (CP) As CoPilot. For Mission dates, targets and Mission Reports, see Combat Missions. 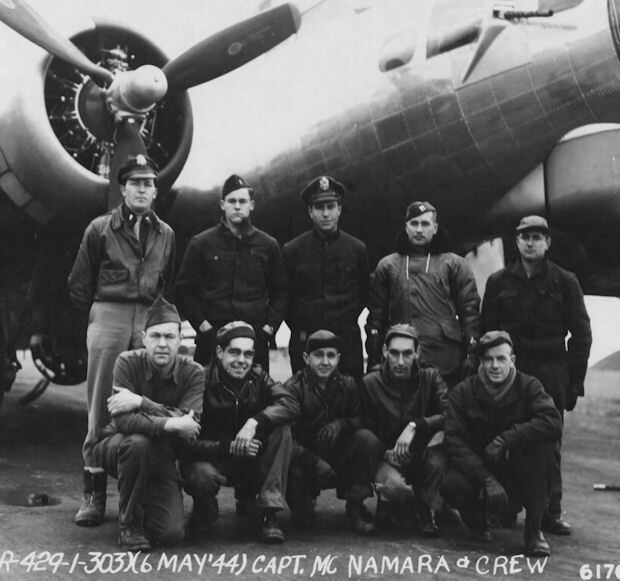 Captain James F. McNamara (P) - Flew on six missions with his assigned crewmen - First two missions (145, 150) as Copilot with a combat Orientation Pilot and other four as his crews First Pilot (151, 153, 155, 157). Assigned as a Lead Crew pilot and flew 20 missions as a Lead Crew CoPilot or Pilot. 26th mission on 15 April 1945. 1Lt Wayne E. Krouskup (N)(Evadee) - Flew on 28 credited missions: With Capt McNamara ( 8 missions - 145, 150, 151, 153, 155, 157, 176, 187); with other Pilots (2 missions - 161 & 164). Flew as a Lead Crew Navigator (18 missions - 163, 165, 171, 175, 176, 178, 179, 180, 187, 189, 190, 199, 202, 205, 210, 214, 227, 229). 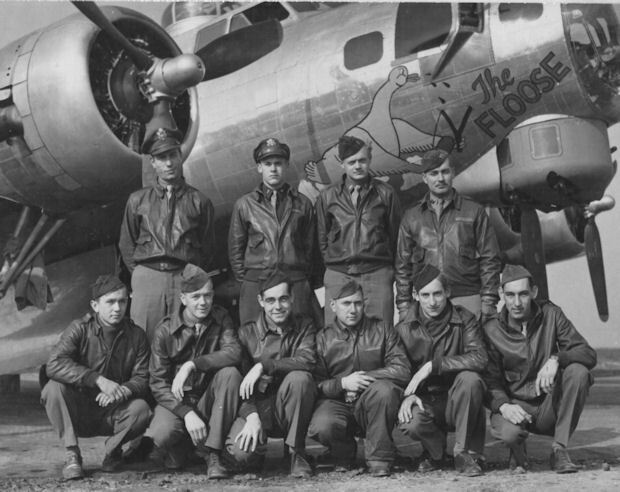 Was shot down on mission 229, 15 August 1944, to Wiesbaden, Germany in B-17G 43-37838 Fearless Fosdick (358BS) VK-A, Capt Arnold S. Litman, Pilot. The B-17 was observed going down in flames and crashed near Wittlich, Germany (1 KIA and 8 Evadees). [MACR 8440]. 2Lt Lawrence M. Wolf, Bombardier, was hit in the back with a 20mm shell explosion and died within 10 minutes while being tended by 1Lt Wayne E. Krouskup. 1Lt Krouskup evaded capture and returned to Molesworth on 3 September 1944. 2Lt Ney (B) - Stood down (209, 214, 215, 219, 221). With other Pilots (175, 176, 187, 210, 211). Flew on 33 missions. Last mission (211) on 24 July 1944. T/Sgt Rodgers (E) - Stood down (221). With other Pilots (220). Flew on 33 missions. Last mission (220) on 5 August 1944. T/Sgt Kustic (R) - Stood down (221). With another Pilot (176), Flew on 33 missions. Last mission (219) on 4 August 1944. S/Sgt Lappo (BTG) - Stood down (221). With another Pilot (187). Flew on 33 missions. Last mission (219) on 4 August 1944. S/Sgt Mikola (RWG) - Stood down (184, 185, 194, 209, 214, 215, 219, 221). With other Pilots (209, 214, 218, 221, 222, 224) . Flew on 31 missions. Last mission (224) on 9 August 1944. One mission flown as Tail Gunner (195). Seven missions flown as Togglier (196, 198, 199, 201, 204, 205, 206). S/Sgt Wagner (LWG) - Stood down (206), With another Pilot (231). Flew on 30 missions. Last mission (231) on 24 August 1944. Sgt Jones (TG) - Stood down (164, 179, 180, 181, 185, 195, 199, 214). Flew on 24 Missions. Last mission (221) on 6 August 1944. One mission flown as Ball Turret Gunner (161).